Lakshmi is the hindu goddess of wealth and prosperity. She is also called "shri". She is wife of Maha Vishnu. Lakshmi is looks as exceptionally beautiful, standing or sitting on a lotus with four hands. Lakshmi is worshipped as the household goddess in most Hindu families, It called varalakshmi vratham. The word ''Lakshmi'' is derived from the Sanskrit word Laksme, meaning "goal" Lakshmi, therefore, represents the goal of life. goddess lakshmi also worshipped as mather of the world. She is famouse hindu goddess worshiped by Hindhus and Jains. Ashtalakshmi is wealth and prosperity goddess. 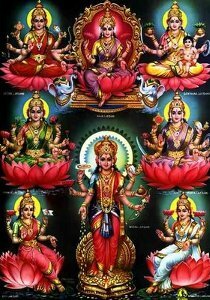 It is believed that where people worship Lakshmi, there is wealth. Wealth does not only mean material prosperity, it also includes the nobler aspects of life, the ethical and the moral values. Goddess Lakshmi is regularly worshipped in home shrines and temples by her devotees. Lakshmi Puja can be done daily but the month of October is specially meant for lakshmi in this month, on the full moon night of 'Kojagari Purnima' Lakshmi Puja is celebrated.